Previously, I outlined the initial stages of my personal preparations for a presentation at American Society of Human Genetics (ASHG) 2015 conference. This was my first platform talk presentation and I was thrilled at the opportunity to share my research. At the same time, I was equally petrified at the prospect of speaking to a room full of knowledgeable society members. In the end, with the help of my mentor and fellow lab members, I gave my talk with minimal hiccups. Here are some tips for preparing your own talk at a conference. 1. Practice makes perfect, really. Even a week before the meeting commenced, I had practiced my talk numerous times to many different people. Not only did this allow me to streamline my sentences, but my words also came out more naturally. This reflected in my tone, allowing for a more conversational speech that was easier for people to follow. Additionally, with repetition, I came to rely less and less on my notes. Most important though, getting comfortable with the words is crucial for timing purposes. Most talks, regardless of types, are usually limited by time, and it is imperative to be concise while keeping to the schedule. 2. Review all uploaded materials meticulously, and prepare backups. Even though PowerPoint is ubiquitous at this point, never underestimate the potential for slides to get distorted when being transferred from one computer to another. For my own upload, minimal edits of font size and type were enough. At the other end of the spectrum, for a few frantic speakers whose data images had completely disappeared after upload, more major reformatting was necessary. Either way, it’s always safest to have a backup of your slides and images in a separate, accessible format. 3. Don’t forget the Q&A portion! Although delivering the data and research is a significant portion of any talk, the Q&A portion is arguably equally as important. This is the opportunity to gauge the audience’s understanding and possibly engage in some meaningful connections. To that end, I prepared by reflecting on my own slides and acknowledged points where things may seem confusing or underdeveloped. This allowed me to formulate some potential questions as well as prepare some possible answers. Of course no one can truly predict all the questions, so keep in mind that “I don’t know” is a perfectly legitimate answer. It is also important to remember that questions are often sparked by genuine curiosity, not animosity, and so answers should reciprocate the same level of enthusiasm. 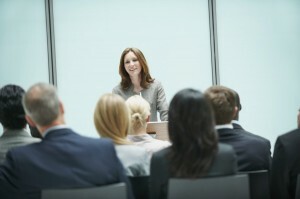 On the day of the presentation, plan for plenty of time for arrival and introductions to the moderators. Remember that everything that can be done has been done, and all that’s left to do is to breathe and begin. In my case, coming up on the dais and looking at the audience, I met many eager faces and a few encouraging smiles. My comments with the first few slides went almost by instinct, until I finally calmed myself and spoke to the audience instead of merely saying words. The talk went much more comfortably after that point. I realized then that it was just like giving a lab meeting, except with a few more friendly stranger-scientists listening in.